rotherham business news: News: New chapter for Rotherham's Central Library? News: New chapter for Rotherham's Central Library? Rotherham Council is seeking views from residents and library users about the possibility of moving the Central Library back to a more central location in Rotherham town centre. Currently based within cultural space at the Council's Riverside House, which opened in 2011, the central library holds the largest collection and range of lending materials in the borough. It was previously housed on Drummond Street alongside former council offices that were demolished to make way for the Tesco Extra. The Council has now said that it is considering moving the library back across town into a new community/cultural hub that could be located opposite Tesco in the Markets, which is due to be developed as part of the Town Centre Masterplan. Cllr. Sarah Allen, cabinet member for Cleaner, Greener Communities at Rotherham Council, said: "Libraries form an integral part of our community and it's important we make them the best we can for the future. "During the consultation process on the Cultural Strategy, we received a number of comments from people who said they would make more use of the library if it was in a more central location. "Local businesses have also told us that they’re keen to see more cultural and leisure facilities in the town. "Moving the Central Library to a new purpose-built hub would enable the Council to create a facility which would be home to a variety of services and functions which would benefit the whole community. "We're asking people to give us their thoughts and tell us which of its services they make use of. We'd also like to know about what services aren't currently offered by the library but which they'd like to see." The authority had been hoping to make savings by subletting part of its offices but is reporting a pressure of £140,000 for its current budget in respect of a saving to let office space at Riverside House, as a result of the proposed tenant withdrawing. 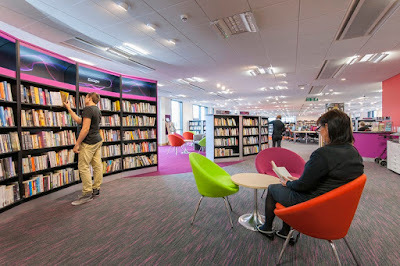 The Council's Library Strategy for 2016-2019 stated that the number of visitors had reduced in some libraries due to many factors, including relocating the Central Library to the edge of the town centre, an increase in the availability of low cost e-books, many people using the internet instead of libraries to find information quickly and also significantly because of a reduction in the level of marketing and outreach. Analysis from the national Libraries Taskforce from last year showed that Rotherham was one of only 31 library services that had increased their visit numbers over the year since 2015-16. Rotherham Council is leading on a new cultural strategy and is also set to undertake consultation on the Library Strategy and future service delivery. The library service is currently recruiting for volunteers. The old Royal Bank of Scotland building would make a splendid and impressive looking library. It’s in a central location and an empty building would also be put to a fantastic purpose too. Sadly, being a commercial property, I guess this will never happen. Given yesterday’s news about Boots, I reckon the Town Centre branch is doomed to close too, so another empty building. As this is all about saving the council some money why not make a start a reduce the number of councillors that should save a few bob.